The experiences people have with loved ones before they pass on can be some of the most intimate and painful moments in life. That may be why we so often keep those stories to ourselves even though they can be life-changing. A stage production at the Rochester Civic Theatre, which runs until Feb. 18, aims to bring those stories to light. The play is called "Stay With Me Awhile" and was written and co-produced by Mary Elizabeth Johnson, a retired hospice chaplain. She spoke with MPR News host Cathy Wurzer about the project. When did you start to realize that there was something special in some of the vigil stories that you were seeing? I began to appreciate the privilege that sitting vigil can be as a very young chaplain, and it became one of [the] most valued parts of that ministry. It's really a privilege to sit around the campfire with people — to be actually invited to sit with them during this incredible time in their lives. And so over the 30-plus years I was at the bedside, I actually develop a real preference for sitting vigil. Getting called out at 3 o'clock in the morning in the middle of a blizzard [was] no problem because I knew that when I would get to the scene of the vigil or get to the hospital that it would be a very compelling time. 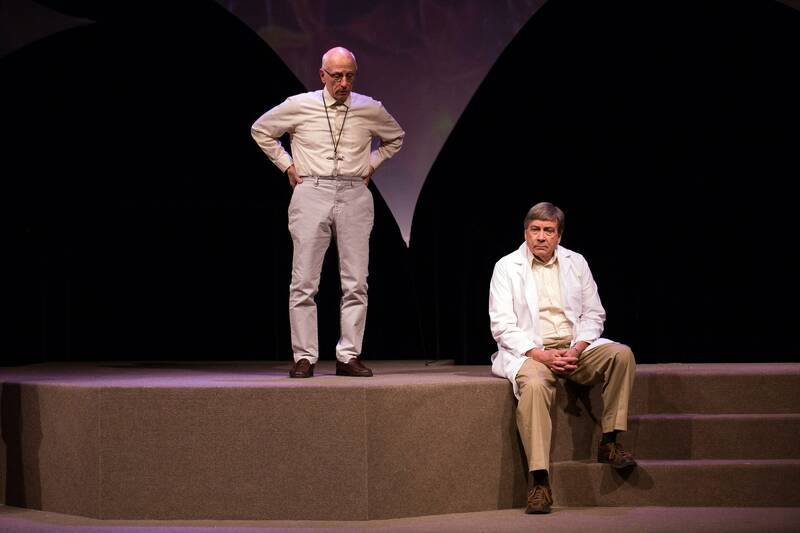 In the play, you cover a variety of end-of-life stories like the deaths of those with dementia and the death of a child. You included the story of a grown man who arrives to see his dying brother and there apparently was no love lost in that story. What was that story about in the play? That story is in the play because there are times when people sit vigil and it's not a hallmark moment. It's a very painful moment. Relationships are broken, they're fractured, and they don't magically repair when the end of life comes. We thought it was really important to include stories that reflect the pain of end-of-life when it comes at a time when healing is no longer possible. Unresolved issues, that kind of thing? Unresolved issues, old hurts that are never addressed, people incapable of acknowledging the truth. I mean, let's face it: the vigil is a microcosm of the relationship, and the vigil doesn't magically change that relationship. So what we see is kind of a snapshot of what has been in the life of that relationship or in the life of that family. Is it possible, then, to find healing during a vigil? I have seen that. I have seen people come to the vigil with that intention. I've also seen the benefit of healing that has happened before the death played out during the vigil, which makes the vigil an amazingly fulfilling experience. Are there other universal threads in these stories that you see on stage? There's a phrase that's repeated throughout the production. It is: "She did the best she could" or "he did the best he could." And I think that's a universal theme. Part of the healing that comes from a vigil is realizing that 'yeah, I did what I could, and I feel OK about that.' "
Click on the audio player above to hear the interview.